Artificial life is a concept that is not a new story field by any stretch. We have our latest offering in Morgan, which actually becomes quite interesting, defying my general dislike on the sub-genre. Frankly, it is tough to have an original story related to the dangers of AI. 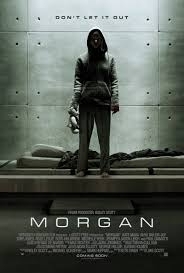 Morgan, made me recall lasts years melding of Sci-fi and horror, Ex Machina. This time, instead of the creation of a new life form from mechanical means, Morgan employs the tampering with DNA line of “Frankensteinian” life creation. At the start of the movie, we witness a hooded individual attack a counselor from a grainy overhead surveillance camera. In a quick montage sequence, the history of Morgan (Anna Taylor-Joy) is depicted to get viewers up to speed. Lee Weathers (Kate Mara) is assigned to determine if the program needs to be shut down, by the company that is paying for the research. Morgan is the product of genetic engineering. They have attempted to create a superhuman by completely altering one-half of the DNA strand. Morgan appears to be a teenager but is only 5 years old. Each of her teachers at the closed off medical facility love Margan in his/her own way, both from watching her grow from inception and being isolated from the rest of the world. Dr. Amy Menser (Rose Leslie) has a strange almost romantic interest in the youth and plays the free-spirited counselor that shows Morgan the outside world. Anna Taylor-Joy is excellent in her second effort of the year following much lauded, The Witch. I am unsure whether the effect on her eyes was from CGI or contacts, but this coupled with her unique beauty made for a hauntingly creepy presence. Paul Giamatti plays an outside psychologist that arrives soon after Lee to determine the mental state of Morgan following the incident. Once again he steals the show in his easy portrayal of the confident, yet foolish doctor. This movie stays interesting throughout. I had certain questions that popped up in the narrative that had a satisfying answer in the end.